In case you haven’t noticed, we’re neck deep into barrel-aged beer season, which I believe is what Andy Williams was thinking about when he wrote, “It’s the Most Wonderful Time of the Year.” You’ll find all sorts of stouts and porters and sours given the barrel treatment this time of year, but Breckenridge Brewing released something a bit different recently. At least, it’s different for 2016. 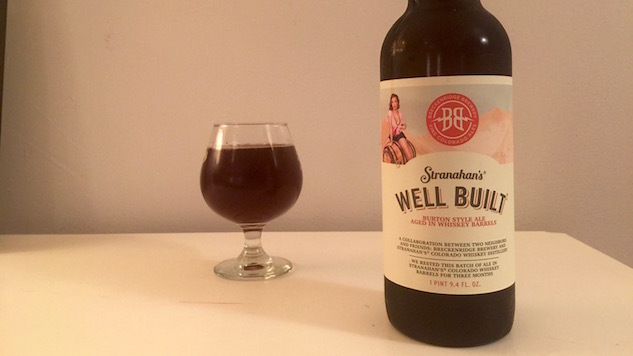 Well Built is a Burton ale, an English strong ale straight out of the history books that had its day in the sun, but is only produced sporadically by modern brewers. Breck’s version is malty as hell, aged for three months in Stranahan’s Colorado Whiskey barrels, and hits all the right notes as the temperatures drop and the Christmas sweaters emerge. The Burton ale comes from the same town that birthed the IPA, Burton-on-Trent. The Burton predates the IPA by at least a hundred years, enjoying its heyday during the 17th and 18th centuries. It was a sweet, strong ale and, by most accounts, everyone loved it. Bass used to brew several different versions of a Burton. The most famous of all Burton ales would probably be Ballantine Burton Ale from Ballantine and Sons Brewing. They started brewing it in the 1930s, aging it in oak for 20 years. Pabst revived the brand a couple of years ago, and you can still find the occasional old bottle if you’re willing to pay a couple hundred bucks for it. I’ve never had the opportunity to try Ballantine’s Burton Ale, so I can’t compare it to Well Built, which is aged for significantly less time. But Well Built won’t set you back nearly as much, so maybe it’s awash. The beer pours a dull, murky brown (enticing, right!?) with no head and smells like red wine. It’s a weird note, because red wine didn’t touch this thing, as far as I know. But there it is, lots of dark fruit and astringent oak and tannins. Sweet notes dominate this beer. You’re hit in the mouth with big waves of caramel and vanilla, which are underscored by a softly carbonated, thin mouthfeel. You get a little bit of the oak barrel after the dip dissipates, with sharp, astringent tannins letting you know the beer spent some time in wood, but I don’t get much in the way of actual whiskey. It’s disappointing in hindsight, but I don’t miss the whiskey notes while I’m deep into the bottle. Maybe the most interesting aspect of this beer, is that there’s nothing obvious on the other side of the coin offering a counterpoint to all that sweetness. The hops are subtle to the point of being nonexistent, there’s nothing bitter, nothing roasted…and yet there is an undeniable balance in the bottle. At no point do I feel like I’m drinking a malt bomb. Instead of hop zing or roasted bitterness, the counterpoint to all that caramel comes from the thin mouthfeel, from the barrel notes, from the subtle boozy element. It all adds up to create a beer that’s sweet, but not saccharine and more complex than the first sip indicates. And it’s definitely one worth looking for during this most wonderful time of the year.